This much is clear: As human numbers have grown, the number of species with whom we share the planet has declined dramatically. While it took about 200,000 years for humanity to reach one billion people around 1800, world population has grown sevenfold since then, surpassing seven billion last year. At the same time, we are witnessing the greatest mass extinction of plant and animal life in the history of human civilization; every year, some 30,000 species become extinct, about three per hour. The relationship between these two phenomena is not simple. Human impact on the environment is mediated by a host of factors, including culture, technology, institutions, and market forces. And inequitable socioeconomic systems mean that some human beings have far greater impact than others. But some generalizations can be made. We live on a planet dominated and transformed by human activity. As we have become more numerous, we have also become more adept at altering ecosystems for human use, replacing species-rich natural landscapes with simpler monocultures. In the last 200 years, human activity has greatly accelerated the rate of species loss. Duke University’s Stuart Pimm and his colleagues calculate that current extinction rates are between 100 and 1,000 times greater than in pre-human times (though more recent studies question whether those numbers are inflated). That loss of biological diversity (biodiversity, for short) has profound implications for the future of life on Earth. Johan Rockström and his colleagues at the Stockholm Resilience Centre have estimated “planetary boundaries” that humanity cannot cross without massive risks to ecosystem health. They conclude that the boundary for biodiversity loss has already been transgressed, and as a result, many ecosystems have lost the resilience conferred by diversity and are at heightened risk of collapse. Biodiversity also provides essential – if uncalculated – economic benefits. One study by Conservation International measured the economic value of ecosystem services to poor communities in priority areas for conservation. The authors found that keeping habitats intact was worth three times as much as exploiting them for short-term gain. The UN’s report on The Economics of Ecosystems and Biodiversity (TEEB) measured the value of intact ecosystems for the poorest people: In India, 47 percent of the income of the poorest comes directly from ecosystems; in Brazil, that figure rises to 89 percent. While the broad association between biodiversity loss and the growth of the human enterprise seems clear enough, the loss of any given species or habitat results from a combination of interlocking demographic, social, political, and economic factors. In the Amazon rainforest, one of the world’s premier biodiversity hotspots, most deforestation results from conversion of land for agriculture, primarily soy grown for export to China. Rising affluence in Asia, therefore, is a more important driver of biodiversity loss in the Amazon than local population growth. In an ever-more globalized economy, local environmental damage is increasingly connected to global market forces. But population dynamics do play a significant role, according to Jason Bremner, program director for population, health, and the environment at the Population Reference Bureau. Throughout the Amazon, small-scale farmers initially clear the forest, in hopes of selling the land to consolidators or speculators, Bremner said in an interview. Those smallholders are often migrants attracted to frontiers of the Amazon in search of land and a livelihood because of inequitable land distribution and unsustainable population density in their home regions. 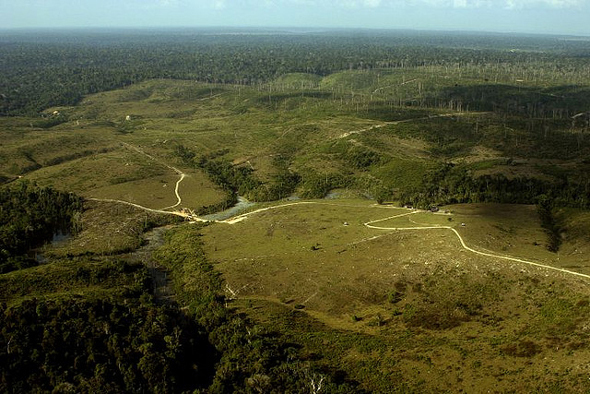 According to a meta-analysis of case studies conducted by Helmut Geist and Eric Lambin in 2001, such population dynamics constitute an “underlying cause” of 61 percent of tropical deforestation. But they warn against a reductive focus on any single factor, such as population or poverty: “the interplay of several proximate as well as underlying factors drive deforestation in a synergetic way,” they write. And, because the interplay of factors is highly contextual, there is no “universal policy” for preventing the loss of habitat and biodiversity. What are the implications for policymakers and practitioners then? Efforts to protect biodiversity must be attuned to local context and take a holistic approach. For example, locally managed marine areas in Fiji halted the decline of marine species and boosted villagers’ incomes by combining traditional resource management practices with modern scientific monitoring. And well-managed “ecotourism” can preserve biodiversity and reduce poverty, according to a study by Craig Leisher of The Nature Conservancy. The best policies, therefore, harness positive synergies among demographic, economic, and social factors. The Population-Health-Environment (PHE) Alliance Project, implemented by the World Wildlife Fund (WWF) from 2008 to 2011 in the Democratic Republic of the Congo is a useful case study. The project combined women’s empowerment, family planning, and basic health interventions with site-based conservation and livelihood efforts in the Monkoto Corridor, which borders Salonga National Park. Salonga is a critical habitat for a number of endemic and endangered species, including the bonobo, humans’ closest primate relative. The Monkoto corridor separates two halves of the park and serves as a vital pathway for wildlife. It is also home to a population of more than 100,000 people who must survive on the resources available in the corridor, not the park. When the project began, rates of childhood vaccination in the Monkoto corridor were among the lowest in the country, while rates of malnutrition were among the highest, according to a WWF report. Because the area’s people rely heavily on bush meat for food and income, and lack comparable alternative livelihoods, poaching poses a serious threat to wildlife in Salonga. In response, WWF helped the Monkoto communities put in place legally binding land zoning plans and promote better land use management. The partners paid special attention to women farmers. “Women are natural allies for conservation,” said Cara Honzak, a senior technical advisor to the Alliance Project, in an interview. Because women have an intense interest in sustaining natural resources to keep their children healthy, said Honzak, it is important to increase their capacity to make informed decisions about nutrition and involve them in land-use planning and governance. The project made significant progress toward those ends. For example, it was able to dramatically increase women’s participation in local committees charged with establishing land use plans. At the project’s inception, there were only three women involved in that process; by 2011, women comprised 1,118 of the committees’ 2,580 members. WWF also provided women and their families with reproductive health services. At the start of the project, Monkoto’s citizens had virtually no access to modern contraception. But a WWF survey found that 56 percent of Monkoto’s women would use contraception if it were available. By 2011, the project consistently saw 300 new family planning users each month. According to Honzak, this kind of integrated effort can serve as an example for conservation efforts around other at-risk ecosystems. It had a positive impact on the livelihoods of Mokoto’s people, particularly women and children’s health. And in turn, enabling women to choose the size of their families and the spacing of their births helps ensure a more sustainable growth rate and reduce direct pressure on surrounding habitats. Sources: AAAS, BioScience, Bloomberg, Gesit and Lambin (2001), Monticello.org, National Geographic, Nature, The Nature Conservancy, Science, TEEB, UNEP, World Bank, World Resources Institute, World Wildlife Fund. Image Credit: Deforestation for cattle in Brazil, courtesy of flickr user leoffreitas (Leonardo F. Freitas); biodiversity hotspots and human population density map, courtesy of John Williams and Springer.